This is a closeout item. Limited sizes available. 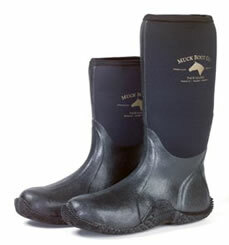 You won’t find a better boot for cleaning stalls and tending animals. The Tack Classic™ is equipped with a crush-resistant toe and reinforcements at the instep and rear heel to provide needed protection when working around hoofed animals. All materials are completely resistant to barnyard contaminants. Hands-free on/off helps eliminate cross-contamination in the barn and home. 100% waterproof - so just hose 'em off. How to select the correct size. Athletic Shoe Size - Muck Boot Size Women's size 8 - select Women's 8, Women's size 7-1/2 - select Women's 8, Men's size 10 - select Men's 10, Men's size 10-1/2 - select Men's size 11.